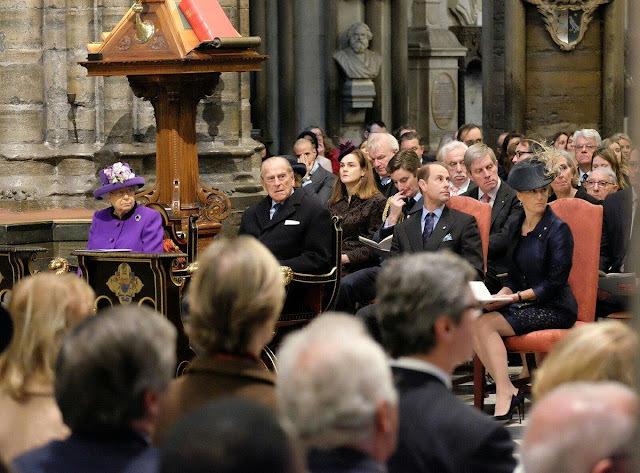 The Queen and The Duke of Edinburgh, accompanied by The Earl and Countess of Wessex, attended a Service of Thanksgiving at Westminster Abbey to celebrate the 60th anniversary of The Duke of Edinburgh's Award. The Wessexes were in attendance, of course, because they're the ones carrying the DoE Award flag for the family these days. The Countess wore a Bruce Oldfield outfit and Jane Taylor hat she first wore to The Queen's Diamond Jubilee service in 2012 - and now here, for another diamond anniversary service. Good jacket, jaunty little hat, maybe a touch too much happening on the skirt, but still, it's easy to see why this has become one of her "special occasion" outfits.